A pomelo is like a massive, sweet tasting grapefruit with a very thick pithy skin. They are often as big as soccer balls. In Thailand, pomelos have light green skin with tiny green dots. The flesh ranges from yellow to yellow with a tint of pink. The thick rind can be about half an inch thick. The seeds are large and rare. When served, pomelos are peeled and presented on a plate, normally after a meal. Pomelos makes a great Thai salad called 'Yum Som O'. Pomelos flower in January and February and the fruit is ready around August and September. 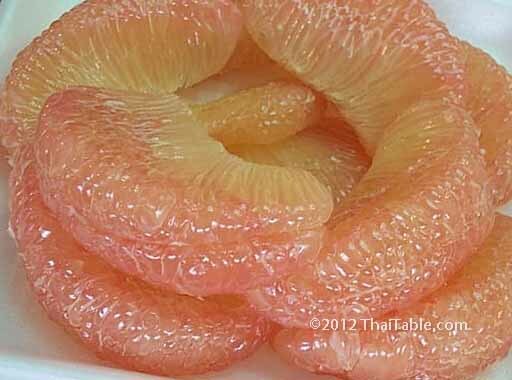 If you are Thailand then, don't forget to taste the Thai pomelos. You can actually find them many other times of the year too, but they are less common. Pomelos are available at supermarkets and from street vendors, peeled and ready to eat. In the US, pomelos have yellow skin with pinkish flesh, similar to grapefruit with no seeds. They taste more acidic and bitter than the Thai counterpart. In January, the pomelos are available at most markets and farmers markets in California. To pick a good pomelo, find the heaviest one for its size and make sure the bottom is not pointy. How to peel a pomelo.